Sunday, February 6, 10 a.m.
Meet 9 AM at Brooklyn Borough Hall's high stairs facing Manhattan. Use www.hopstop.com for directions. Note: No registration need since public transportation is used. This walk entails at least a 3.5 mile winter walk through neighborhoods starting at newly opened Brooklyn Bridge Park (after Borough Hall), ending at Red Hook (Ikea Store) section. Walk focuses mostly on seabirds, ducks and gulls. Bad or unsafe weather cancels. Sunday, February 6, 2011, 6:00 p.m. to 8:00 p.m. Walk the woodlands of Long Pond Park in search of resident owls. A quiet walk is likely to lead to the discovery of Screech Owls. Though ambient light brightens the night sky, flashlights are acceptable. Meet at the corner of Amboy Rd. and Page Ave.
Greetings. This is the New York Rare Bird Alert for Friday, January 28th, at 9:00pm. The highlights of today's tape are VARIED THRUSH, LITTLE GULL, BARROW'S GOLDENEYE, GREATER WHITE-FRONTED GOOSE, NORTHERN SHRIKE, and pelagic trip results. Last weekend much of the area's excitement was centered out east on Long Island: the sea duck spectacle, with tens of thousands of birds involved as they constantly cycled around Montauk Point in their feeding routine, included two KING EIDERS found off the lighthouse last Saturday. Over 30 RAZORBILLS, and an adult LITTLE GULL among the Bonaparte's feeding offshore, added to the variety. The immature ICELAND GULL was still along the beach west of the Montauk Harbor inlet last weekend, and the Fort Pond Bay LESSER BLACK-BACKED GULL was seen Saturday on the ice on Fort Pond. At Napeague the NORTHERN SHRIKE was seen Saturday at the end of Lazy Point Road, and on Sunday, farther down the same road, before it hits Napeague Meadow Road, as this bird continues to range around quite a bit. The drake BARROW'S GOLDENEYE was still around the southwest corner of Noyack Bay, just east of Noyack last Saturday, keeping company with a number of Common Goldeneye. This area is best viewed along the western end of Long Beach parking lot that parallels Long Beach Road, Route 60. This spot provides a good panorama of the south end of the bay. In East Hampton two GREATER WHITE-FRONTED GEESE were seen on the pond on the north side of Dunemere Lane, just north of Hook Pond, on Saturday, and the next day they were with Canadas on the south side of Further Lane, this spot not as visible as the usual field across the street. Highlights along Dune Road, west of Shinnecock Inlet at low tide last Saturday included AMERICAN BITTERN, three CLAPPER RAILS, and SHORT-EARED OWL. Two TRUMPETER SWANS on Swan Lake on the east side of Patchhogue Saturday may be the same two previously on Upper Lake in Yaphank. The VARIED THRUSH was still in Central Park yesterday, continuing next to the maintenance shed that contains the rest rooms. The thrush is usually in the brushy area on the east or right side of the building, which is just south of the 79th Street Transverse across the park. The closest park entrance is at 5th Avenue and 79th Street. Take the path in just south of 79th Street and continue to the maintenance area, which is just across the Central Park north roadway [aka East Drive]. A BLACK VULTURE was also seen over the park on Thursday, and two drake WOOD DUCKS continued at The Pond [located at the southeast corner of the park]. We have no recent word on the immature Red-headed Woodpecker along the south side of the Sheep Meadow. A pelagic trip Sunday from Freeport aboard the Captain Lou VII ventured about 20 miles out in punishing conditions and did record one THICK-BILLED MURRE and 31 COMMON MURRES, 27 RAZORBILLS, and 66 other large but unidentified alcids. Gulls included one GLAUCOUS GULL, one ICELAND GULL, two LESSER BLACK-BACKED GULLS, and 21 BLACK-LEGGED KITTIWAKES. This trip was sponsored by See Life Paulagics, and a second trip is scheduled on the same boat out of Freeport on February 13th. For more information, visit their website at http://www.paulagics.com . 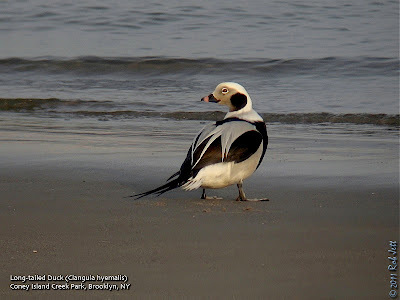 At Floyd Bennett Field in Brooklyn a LAPLAND LONGSPUR was present last Saturday, and a RED-SHOULDERED HAWK has been frequenting that area, with another across the bridge at Fort Tilden, where a drake HARLEQUIN DUCK remains along the jetties off the fishermen's parking lot. An ICELAND GULL was also seen at Fort Tilden on Wednesday. A LAPLAND LONGSPUR was with Horned Larks in the field 2 parking lot at Jones Beach West End last Sunday. During the winter months my friend, Peter, maintains several bird feeders at Breeze Hill in Prospect Park. This winter, because of all the snow cover, it has become the focal point of most of the park's bird activity. I've been following the activities of our local Red-tailed Hawks for over a dozen years. During that time I've noticed that they tend to stray from the parks in the winter and can frequently be found hunting in the residential areas. I think I finally figured out why. In Spring and Summer Red-tailed Hawks are the only raptor at the top of the food chain in the park. There are American Kestrels nesting outside of the parks, but these tiny birds don't compete for the same food. Over the winter, several species of raptors call the parks home. 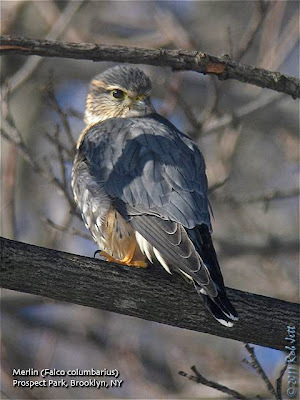 In Prospect Park this winter I've spotted a pair of Merlins, a Cooper's Hawk, a Sharp-shinned Hawk and, of course, our local adult Red-tailed Hawks and at least one of last year's offspring. 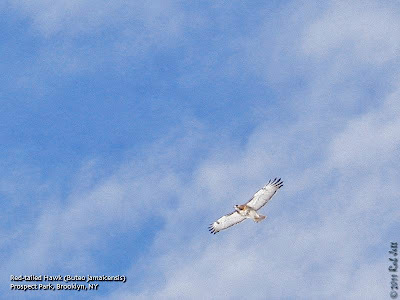 It's no wonder that the red-tails are seen hunting pigeons in Park Slope and other surrounding neighborhoods. Late afternoon on Wednesday I had an experience at the Breeze Hill bird feeders that drove home the point of raptor competition in Prospect Park. When I first arrived at the feeders there were songbirds everywhere; perched on the 7 feeders, waiting their turns above the feeders, scraping in the snow below the feeders, plus, there was a near constant stream of chickadees, White-breasted Nuthatches, White-throated Sparrows, cardinals and Red-winged Blackbird flying back and forth across Wellhouse Drive. I spotted 3 Pine Siskins jostling with the goldfinches on the only 2 thistle feeders. 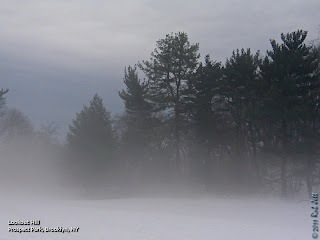 Moments after I arrived, however, all the birds vanished, flying for cover in the surrounding trees and shrubs. A Cooper's Hawk landed on the snow right below one of the sunflower seed feeders. It was a huge female bird about the size of an American Crow. When she flew to a branch above the feeders I saw that she had missed her target...this time. The songbirds remained quiet and hidden. A few chickadees gradually began to emerge and returned to the feeders in full view of the hawk. I guess they thought that their diminutive size and acrobatic skills would preclude them as possible prey. Either that or hunger overpowered caution. The coops finally took off, flying towards Lookout Hill. The birds remained wary, taking about 15 minutes to return to the feeding frenzy that I had witnessed upon my arrival. While I was scanning the feeding birds I realized that there was someone standing behind me. A young couple had arrived and were quietly observing the bird activity. They didn't have binoculars, but one did have a camera around his neck. I smiled and he said, "I just discovered this spot the other day and couldn't believe it." I supposed he meant the abundance of bird life. That was enough to get me started with a brief first lesson on the winter birds in the park. Those of you who know me, know what I mean. After a few minutes I mentioned that if they ever see the birds suddenly flush, to look around for birds of prey. No sooner had those words left my lips, then the birds all took off. I looked up for the coops or, maybe, a red-tailed, but couldn't find anything. Then this guy's girlfriend points to the ground and says, "Is that a hawk?" At first I didn't see it because I was looking too far in the distance. 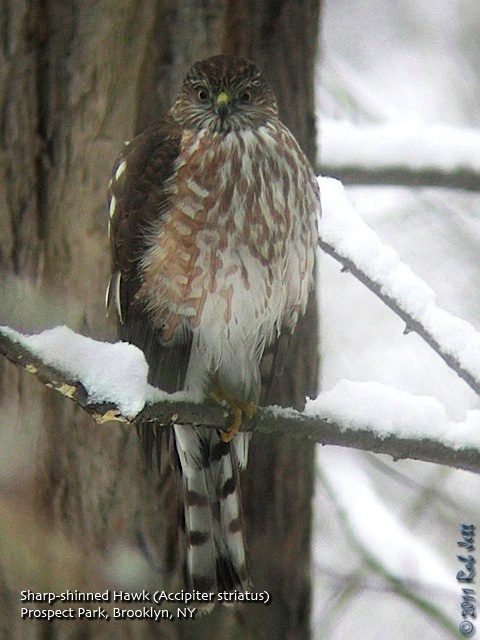 I finally realized that there was a small Sharp-shinned Hawk standing in the snow at the base of a cherry tree about ten feet away. There was a small opening in the tree near the ground, plus, Peter had piled up some black, plastic planters in that spot. The hawk seemed to think that there was a bird hiding within the tangle. 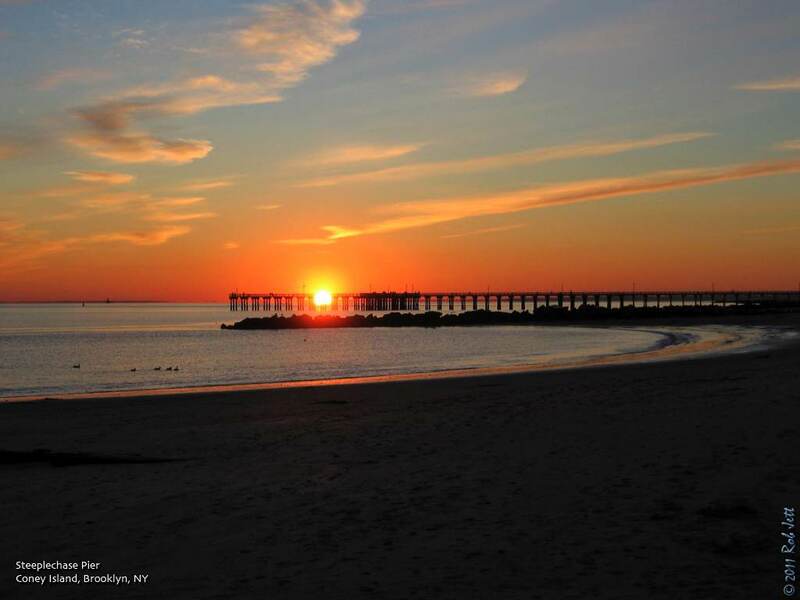 A view of Coney Island's Steeplechase Pier at sunset. Despite wintry temperatures, there were lots of people strolling along the frozen sand and icy boardwalk. One person was actually swimming! 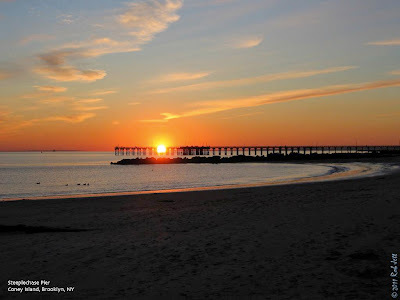 Most people just refer to the pier as either the Coney Island fishing pier or Steeplechase Pier. The full name on the Department of Parks and Recreation sign is "Pat Auletta Steeplechase Pier" and honors the late "Mayor" of Coney Island. I was pleasantly surprised the other day to see Max adding twigs to and tidying up last year's nest at Nelly's Lawn. The nest is in a conifer that has died over the winter. I'm a little conflicted about their decision to reuse this nest because, on the one hand, a lack of needles in the tree will make observing the nest really easy. However, it also means that the nest will have no cover in inclement weather. I'm also concerned that the dead trees branches will be very brittle and, possibly, break under the weight of the nest. I guess all I can do is wait and watch. Saturday morning began as the coldest day so far this year. At 17 degrees, with windchills near zero, I made sure to wear extra layers and carry a pair of glove warmers so I didn't end up with frostbite. I suppose I could have just stayed indoors all day, but there were still lots of birds to be found in Brooklyn this month. As usual, my partner in crime was Heydi and we were heading to the coast. We've both been to Floyd Bennett Field several times this month trying to find Lapland Longspur, a winter rarity. In addition, she needed to locate Snow Buntings for her year list. Having learned the unique, trilling flight call of the latter I'm certain that if one is even just passing overhead, I'll find it. We decided to check Dead Horse Bay to look for seaducks before trekking around the snow at Floyd Bennett. The last time I was there a few thousand scaup were hanging around the cove near the Flatbush Marina. With that many waterfowl together, it's possible to find something other than scaup in the group. On Saturday, however, the scaup were no longer present, nor were any other ducks, so we headed back across Flatbush Avenue and into Floyd Bennett Field. The last time that I was at Floyd Bennett I spotted a flock of 6 Snow Buntings on the sidewalk next to the bus shelter. They were foraging on the seeds of some type of low plants growing up through the cracks in the pavement. Whatever the plants were, they seem to really like it because, as Heydi and I approached the bus shelter on Saturday we saw the same flock of 6 buntings feeding on the sidewalk. 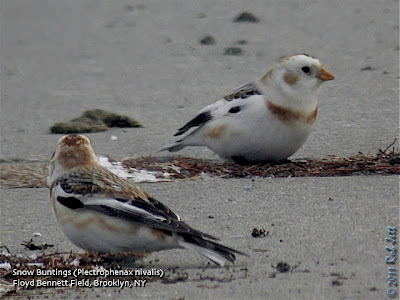 Snow Buntings are not an easy bird to find in Brooklyn, so this was a good thing. We walked around to the south side of the shelter using it as a blind to take some photos of these white songbirds. Check out Heydi's January photos here. We left the Snow Buntings and headed towards the Cricket Field to look for the Horned Larks flocks and, hopefully, a longspur. Along the way we stopped to get a closer look at an unusual raptor that was being harassed by crows near Ecology Village. 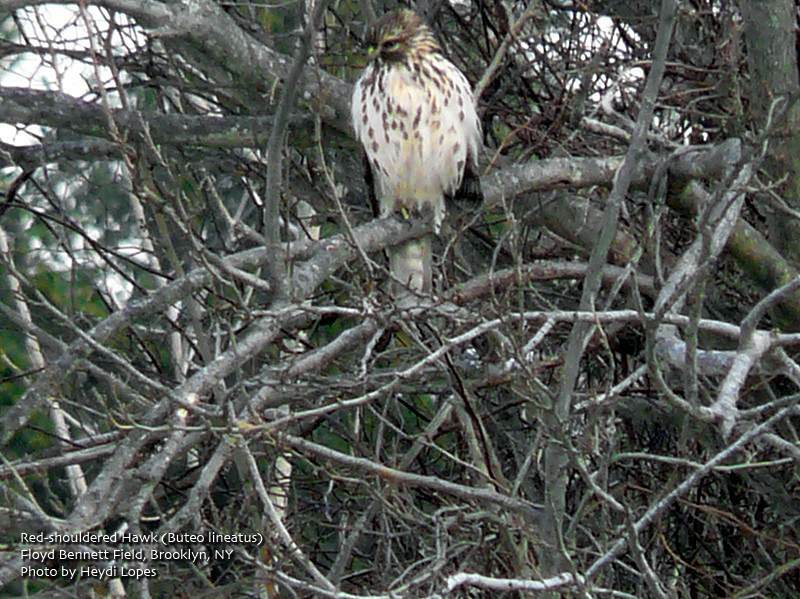 The slender buteo turned out to be a juvenile Red-shouldered Hawk. Adult red-shoulders are distinctive but the brown-streaked juvies can be difficult to identify when perched. 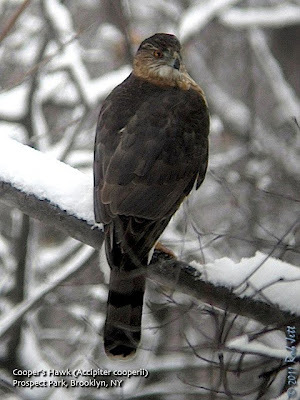 Their relatively long tail gives them an accipiter-like appearance. Snow still blanketed most of the open fields making it difficult for Horned Larks and other winter birds to find forage. At the small field next to Aviator Sports there was enough vegetation sticking up out of the snow and ice that a flock of about 90 larks fed close to the parking lot. Heydi and I scanned and rescanned the birds, but didn't find any longspurs. The Cricket Field is usually the best spot to find these visiting arctic birds, but for weeks the grass has been sealed in by a hard, white, crusty shell. We decided to check out the Cricket Field, anyway. Our silly optimism wasn't enough to make bird with pickaxes appear on the field, so we turned around after only a few seconds. As we passed the parking lot at Aviator Sports Heydi pointed out a small, sparrow-like bird that had just landed on the pavement. I rolled down my window, focused my bins and calmly said, "It's a longspur." It was my fifth visit to Floyd Bennett Field this month looking for longspurs, so I guess the lesson is that persistence pays off. On Martin Luther King Day I took the train to Coney Island in search of rare gulls and seaducks. The weather was strange with foreboding skies looming overhead. It sometimes felt like a tornado was brewing just over the horizon. 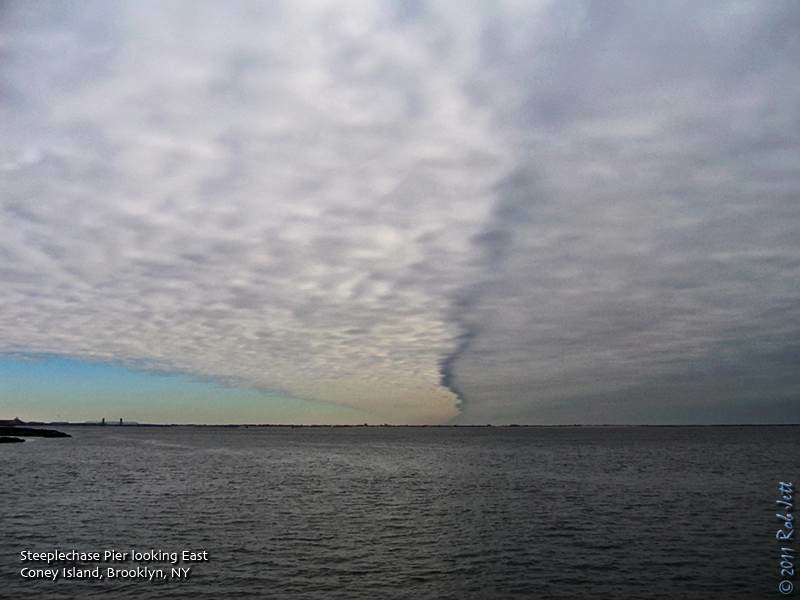 An unbroken black line marked the edge between a curtain of dark-gray scalloped clouds and white, thin clouds edge by a hazy, pastel-tinted sky. I stood on the fishing pier scanning the water for flocks of scoters or eiders, but kept peering up at the sky wondering if it was safe to be out over the bay. The scarcity of birds on the water made me think that they knew something that I didn't, but should. 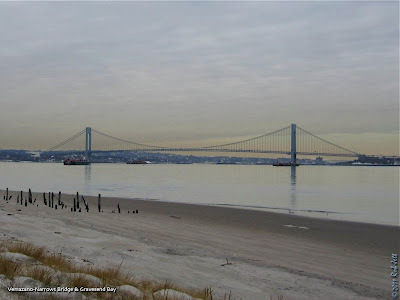 I walked the 2 mile stretch from the pier to the beach at Coney Island Creek Park and set-up my scope facing Gravesend Bay and the Verrazano Bridge. The horizon to the north showed an eerie, gold hue. There were a few scattered Common Goldeneye in the location, but a flock of Bonaparte's Gulls close to the shore towards Norton's Point seemed interesting. I thought there was a chance that the Black-headed Gull might be within the flock and started walking up the beach. I've learned from more experienced birders, especially my friend Shane, that the place to bird in Brooklyn during the winter is along the coast. It's been a little challenging this year with record snow falls and extremely low temperatures, but it hasn't stopped me. Heydi has been concerned that by missing a few days of birding earlier in the month she won't be able to catch up with Doug, Shane and myself. It's a silly competitive thing, but three of the four of us have already tallied 80 species of birds or more in January. I've assured her that most of what we've seen she will get on her list at some point. It is the rarer, winter species that she should focus on finding. With that in mind, the two of us decided to bird Coney Island Pier, Dead Horse Bay, Floyd Bennett Field and Gravesend Bay. I suggested finishing the day at Prospect Park, where she would have a good chance of finding Pine Siskins at the bird feeders. It was a frigid morning and most normal people were staying far away from the beaches. 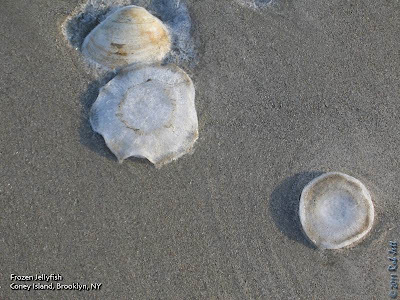 In fact, it was so cold that we found these frozen jellyfish on the shore at Coney Island. I believe that they were Moon Jellyfish. The water was a lot warmer than the air, so I guess these cnydaria would have survived had the tide not carried them onto the sand. 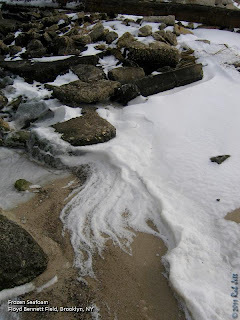 Along the eastern shoreline at Floyd Bennett Field the low temperature had frozen seafoam into styrofoam-like sculptures. The weather didn't seem to affect the waterfowl and other seabirds as we tallied a fairly decent day list. Heydi added a lot of new birds, enough to bring her up into the top 5 for Kings county. I'm pretty sure she won't be satisfied until she is one of the top 2, then she'll just have to kill me. Saturday, January 29, 2011, 12 noon to 2:00 p.m. Evidence of animal life as well the geologic history and human influence will be observed as we take an unhurried stroll on a one and a half mile hike through the park. Meet at PS 6, on Page Avenue and Academy Avenue, about 3 blocks northwest of Hylan Blvd. Sunday, January 30, 2011, 9:00 a.m. to 11:00 a.m. Walk the mud flats and beach front for an investigation of wintering waterfowl. Dozens of waterfowl species call the Raritan Bay home for the winter. A brief search is sure to uncover Bufflehead, Brant, Goldeneye, Grebes and Geese. Expect a cold wind and dress appropriately. Meet in the main entrance parking area on Hylan Blvd. across from Buffalo St. From there the group will proceed to the main parking lot by the beach. Sunday, January 30, 2011, 6:00 p.m. to 8:00 p.m. Walk the trails of Staten Island’s southern tip exploring the beach and woodland for our night time neighbors. Screech Owl and Great Horned Owl utilize the park throughout the year and with luck we will hear their calls. Though ambient light brightens the night sky flashlights are acceptable. Meet at the parking lot at the end of Hylan Blvd. on the left. Loons, Grebes, and Buffleheads...Oh My! Greetings. This is the New York Rare Bird Alert for Friday, January 21st 2011 at 8pm. The highlights of today's tape are VARIED THRUSH, BARNACLE GOOSE, GREATER WHITE-FRONTED GOOSE, CACKLING GOOSE, BARROW'S GOLDENEYE, BLACK-HEADED GULL, GLAUCOUS GULL, ICELAND GULL, NORTHERN SHRIKE, WHITE-WINGED CROSSBILL and more. The fairly accommodating Central Park VARIED THRUSH continues around the Maintenance Field area where it is usually seen foraging on the upslope on the north side of the pedestrian path just east of the building called the Rambles Shed which contains restrooms. This site is just south of the 79th Street transverse through the park and can be reached by taking the path from 5th Avenue just south of the transverse, continue into the park and across the Central Park north roadway to the maintenance area just across the road. Also look for the immature RED-HEADED WOODPECKER in the trees on the south side of the Sheep Meadow where it is usually just north of the 66th Street transverse. The BARNACLE GOOSE has recently been most reliably seen as it roosts overnight on Belmont Lake State Park accompanying many Canada as well as 4 GREATER WHITE-FRONTED GEESE and 2 CACKLING GEESE. A substantial flight of geese onto the lake last Sunday evening at dusk and later did produce all the above the following morning. The morning departure of these geese from the lake seems to be variable but it is recommended to get there early. WOOD DUCK is among the other waterfowl there. If not on the lake try nearby St. Charles Cemetery for the BARNACLE GOOSE. The immature BLACK-HEADED GULL was seen again Monday on Veteran's Memorial Pier in Bay Ridge Brooklyn and the adult presumably continues around Owl's Head Park. It appears at the end of Bay Ridge Avenue or 69th Street and Shore Road. 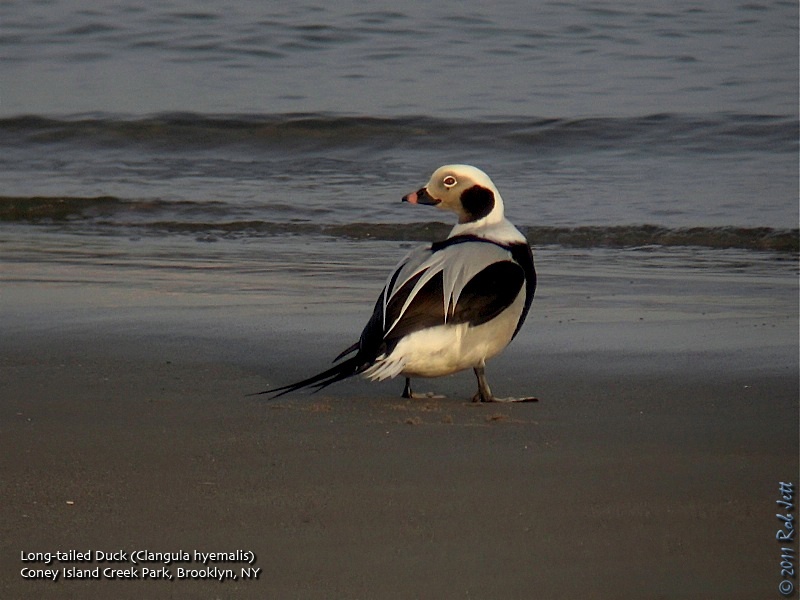 A LESSER BLACK-BACKED GULL was also seen on Gravesend Bay Monday and a LAPLAND LONGSPUR appeared on the Brooklyn Golf Driving Range off Flatbush Avenue. 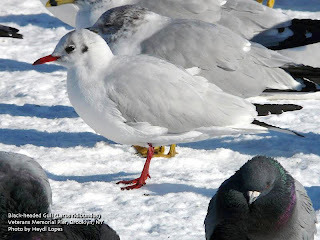 At Point Lookout a BLACK-HEADED GULL was seen in the inlet last Saturday with an ICELAND GULL in the town park parking lot on Sunday. Up to 6 HARLEQUIN DUCKS continue along the inlet and ocean front jetties. Across Jones and later Jones Beach West End a flock of up to 20 COMMON REDPOLLS has been present usually along the median where a WHITE-WINGED CROSSBILL was also reported Monday. One or more LAPLAND LONGSPURS have also been traveling with the Horned Lark and Snow Bunting flocks. 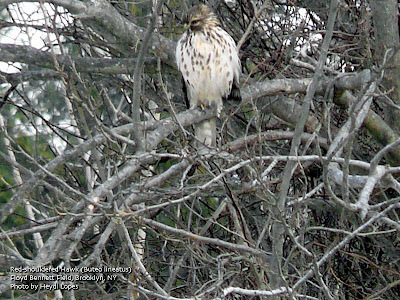 Joining the hunting COOPER'S HAWKS and SHARP-SHINNED HAWKS around the West End was a large, probably female, NORTHERN GOSHAWK last Sunday. The bird seen between the West End 2 and Nature Center parking lots before crossing over the median towards the police station. 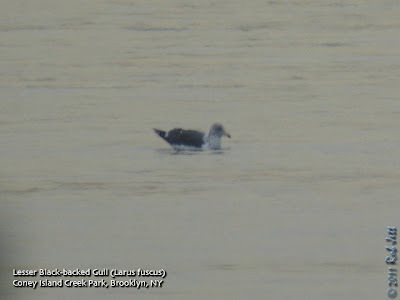 A LESSER BLACK-BACKED GULL was reported from lot 2 Tuesday. 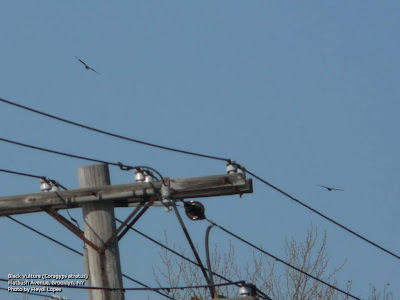 Both light and dark phase ROUGH-LEGGED HAWKS have been present recently along the eastern end of the Jones strip between Cedar Beach and Captree. A decent number of REDHEAD continue on Capri Pond off Route 27A a little west of the Robert Moses Causeway. An EASTERN PHOEBE was spotted at the fish hatchery Saturday at Connetquot River State Park where some feeder visiting NORTHERN BOBWHITE continue. These apparently part of a reintroduction program. Four COMMON REDPOLLS were are Bayard Cutting Arboretum Saturday. Out at Montauk Point a few dozen RAZORBILLS continue as does a large congregation of sea ducks which included 5 KING EIDER last Sunday. 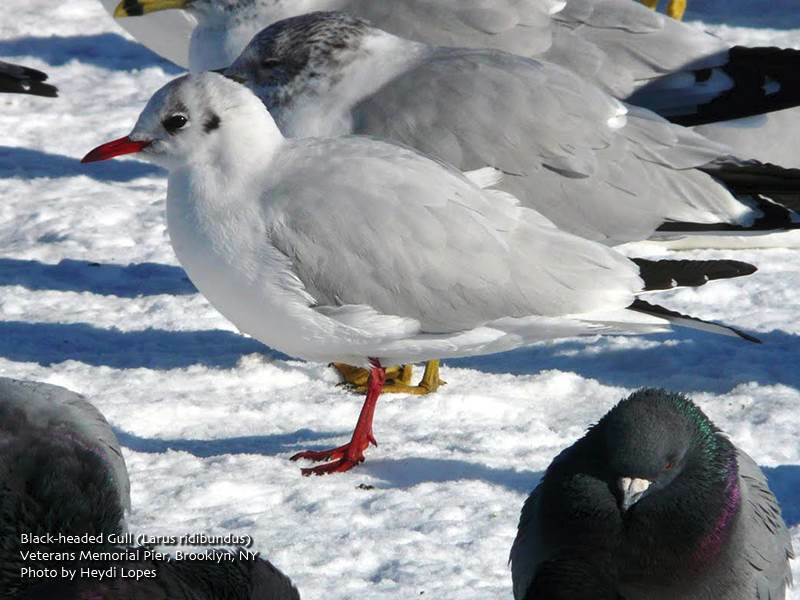 Gulls in the area recently have included an ICELAND GULL at the restaurant Monday and another continuing west of the Montauk Harbor Inlet and a LESSER BLACK-BACKED GULL remaining along the shore of Fort Pond Bay. A few COMMON REDPOLL have been noted in that area and a WHITE-WINGED CROSSBILL was found at the point Monday. A NORTHERN SHRIKE last Saturday at Napeague was first seen at the end of Lazy Point Road and later along Napeague Meadow Road this apparently moving around quite a bit. The drake BARROW'S GOLDENEYE continues just east of Noyak but can be hard to find. It has been seen on Noyak Bay recently from the western end of Long Beach Road (Route 60) and Noyak Road. Six GREATER WHITE-FRONTED GEESE were still in East Hampton Saturday seen just north of Hook Pond. Dune Road, west of Shinnecock Inlet, has recently produced a couple of AMERICAN BITTERN and CLAPPER RAIL west of Tiana Beach, SHORT-EARED OWL just east of the Ponquogue Bridge and last Saturday single SEASIDE SPARROW and NELSON'S SPARROW along a tidal channel near Triton Lane. The immature GLAUCOUS GULL remains near the Orient Point Ferry terminal. BALD EAGLES are in good numbers along the Hudson River now. Even in his "drab" non-breeding plumage, this male Long-tailed Duck is still a stunning bird. An arctic breeder, they can be found along the coast of New York throughout the winter. This individual was preening on the shore at Coney Island Creek Park early Saturday morning. "Save Pouch Camp" Hike in the Greenbelt, S.I. Saturday, January 22, 9:45 a.m. to 4:00 p.m.
Come join others who enjoy a cold day outdoors. It is ten moderate miles at a comfortable pace. Meet at the beginning of the Blue Trail at the end of Staten Island Blvd., off Ocean Terrace by the Sunnyside campus of the Petrides complex. Bring lunch and beverage and sturdy walking shoes. Dress warmly in layers. We go in all weather but walk is shortened if high pollution levels occur. Come see what the inter woodland has to offer: winter birds, bare forest trees, frozen ponds, evergreens and possibly some snow cover to detect deer visits, and always beautiful vistas. For more information call Dominic Durso at (917) 478-7607, Charles Perry at (718) 667-1393 or Don Recklies at (718) 768-9036. 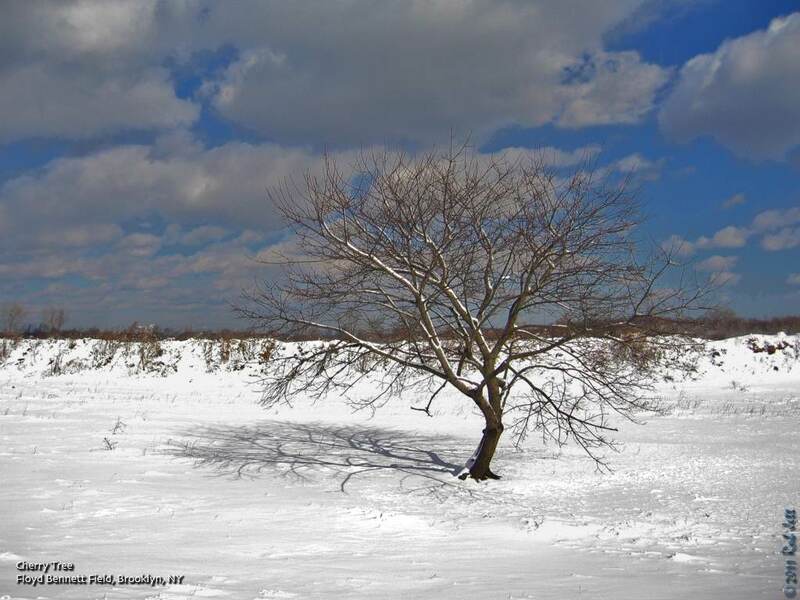 Saturday, January 22, 12 noon to 2:00 p.m.
We'll follow the multi-use trail overlooking Fresh Kills, pass the famous Hessian Spring as it crosses the path and view Fresh Kills estuary and work our way to the remains of Ketchum’s Mill. Along the way we’ll observe traces of the past, examine the present woodland ecosystems and search for evidence of present inhabitants especially deer and other mammals. Park at the start of Old Mill Road alongside St. Andrew’s church. See how many species you can add to your life list. Binoculars provided. Greetings. 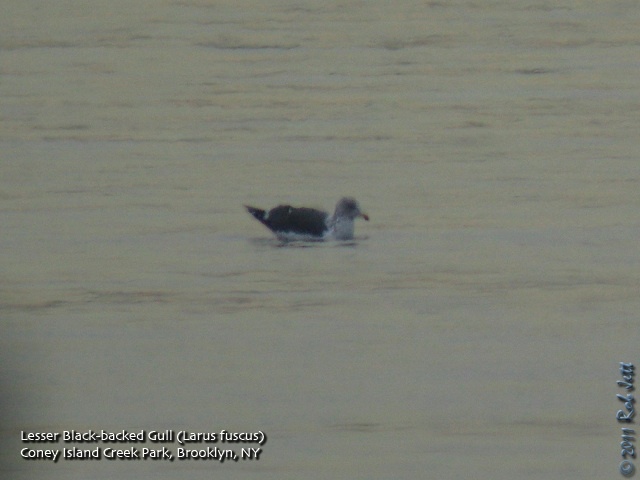 This is the New York Rare Bird Alert for Friday, January 14th 2011 at 8pm. The highlights of today's tape are LE CONTE'S SPARROW, VARIED THRUSH, BLACK-HEADED GULL, BARNACLE GOOSE, GREATER WHITE-FRONTED GOOSE, BARROW'S GOLDENEYE and more. Last Saturday afternoon, what might be New York's first documented winter record of a LE CONTE'S SPARROW, was found along the runways at the Calverton Grasslands, this the former Grumman Airport property. The sparrow mostly frequented a 2 foot Juniper Tree adjacent to a fence near an electrical apparatus or 2 even smaller Junipers nearby and occasionally also moving farther afield. The 2 foot Juniper was however the bird's sanctuary and it remained there at least to midday Sunday. The reason for its disappearance is yet unclear although it had been pushed a bit. A LARK SPARROW was also still being seen around the grasslands at least to Tuesday. Staying since discovery along the chain link fence just west of the main entrance to the grasslands off Grumman Boulevard. By mid Sunday the LARK SPARROW had moved north to Route 25 where it was feeding in a mixed sparrow flock near the Route 25 entrance to this property. That these grasslands should be preserved intact is certainly apparent based on their value as a vibrant natural and disappearing habitat. Other birds present there this past week have included ROUGH-LEGGED HAWK, AMERICAN KESTREL, some HORNED LARKS, EASTERN BLUEBIRDS, over 50 SNOW BUNTINGS, a good variety of sparrows and some EASTERN MEADOWLARKS. A CACKLING GOOSE was in a Canada flock on nearby Hulse Landing Road Saturday. The Central Park VARIED THRUSH continues to be seen usually in its favored location which is the Maintenance Field area on the south side of the 79th Street transverse. Look for the thrush on the upslope next to and just east of the Ramble shed buildings which contain restrooms. The slope is north of the pedestrian path and south of the transverse. This area can be reached by entering the park at 5th Avenue and 79th Street, take the path on the south side of the transverse across the Central Park north roadway and look for the maintenance buildings on the other side of the road. The immature RED-HEADED WOODPECKER continues in the trees on the south side of the Sheep Meadow usually just north of the 66th Street transverse. Two drake WOOD DUCK have been on [The Pond] just south of there. PINE SISKIN and RUSTY BLACKBIRD are among the nice variety of winter birds in Central Park recently. The adult BLACK-HEADED GULL was still at Veteran's Memorial Fishing Pier in Bay Ridge Brooklyn Sunday. This pier is next to Owl's Head Park at the end of Bay Ridge Avenue or 69th Street and Shore Road. Two BLACK VULTURES in Brooklyn last Sunday were followed by 3 over Prospect Park Thursday. A BARNACLE GOOSE has been roosting overnight recently on Belmont Lake State Park. After leaving in the morning, usually by about 8:30a, it has been relocated on the St. Charles Cemetery property to the west usually near the Wellwood Avenue entrance. One or two CACKLING GEESE have also been on Belmont Lake State Park. On Tuesday a banded BARNACLE GOOSE, presumably a different individual, and 4 GREATER WHITE-FRONTED GEESE were found at Pine Lawn Memorial Park by the Pine Lawn train station this area just north and east of St. Charles Cemetery. Out east 4 GREATER WHITE-FRONTED GEESE were again Tuesday on a field on Further Lane in East Hampton. A good number of RAZORBILLS continue off Montauk Point. A BARROW'S GOLDENEYE remains along the Route 25 causeway between East Marion and Orient on the north fork usually near the east end of the causeway but sometimes not locatable. The immature GLAUCOUS GULL remains near the Orient Ferry Terminal and 5 COMMON REDPOLL were in Orient Beach State Park Sunday. 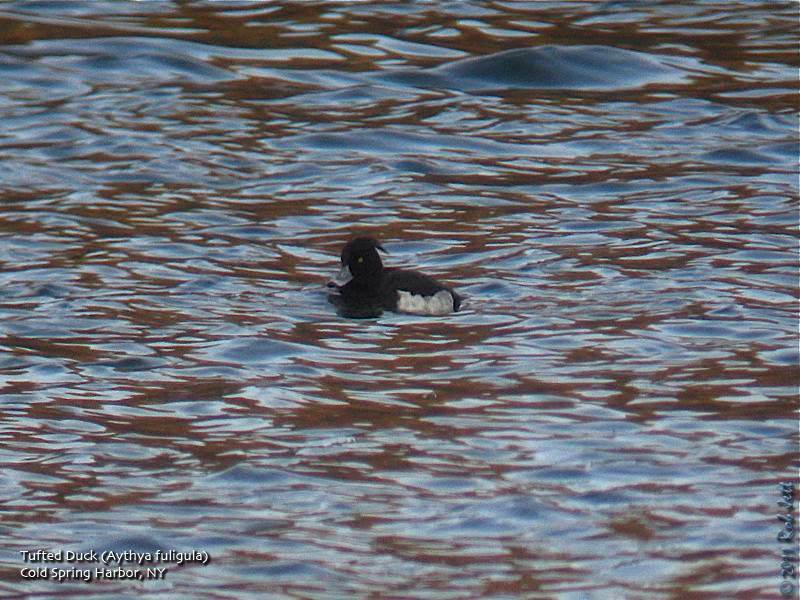 The Cold Spring TUFTED DUCK has not been seen since last Friday. 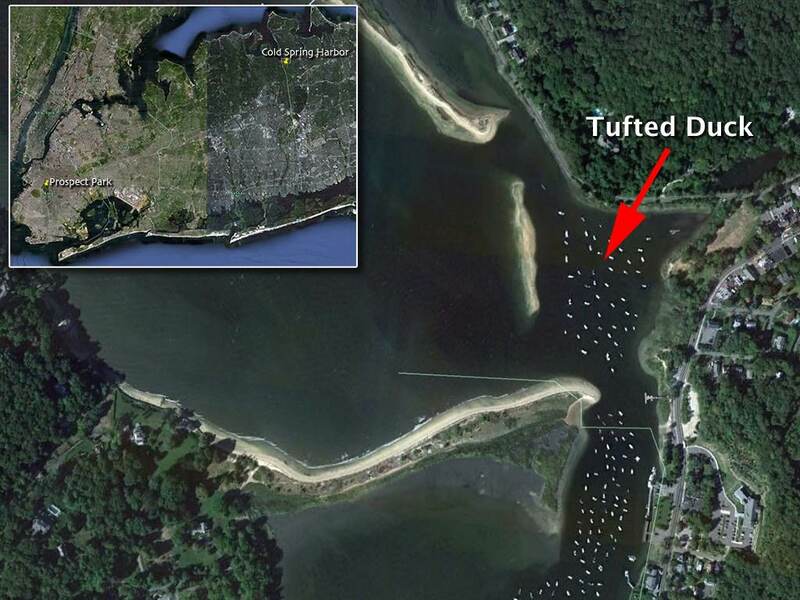 A SPOTTED SANDPIPER was reported last weekend from Goldsmith's Inlet in Peconic. A LESSER BLACK-BACKED GULL was on Lake Agawam in Southampton Sunday and recent birds along Dune Road west of Shinnecock Inlet have included an ICELAND GULL Sunday by the Ponquogue Bridge, AMERICAN BITTERN, CLAPPER RAIL, WILSON'S SNIPE, AMERICAN PIPIT, an "IPSWICH" SAVANNAH SPARROW and SEASIDE SPARROW and a few COMMON REDPOLLS there today. Around Jones Beach West End a LAPLAND LONGSPUR was spotted Wednesday, 2 on Friday along with 15 COMMON REDPOLLS with 8 RED KNOT and SHORT-EARED OWL last Saturday. Two COMMON REDPOLLS were on Oak Beach Road Tuesday and a LESSER BLACK-BACKED GULL was at Jones field 6 Friday. Merlins are one of two small falcon species found around NYC in the winter. Sometimes referred to as the "Pigeon Hawk", their primary prey is small birds, which they catch on the wing. In Brooklyn, they can usually be found at the edges of Prospect Park's and Green-Wood Cemetery's fields and meadows. While some of my friends were still doing Christmas Bird Counts on Long Island and Upstate New York, I opted to start the New Year in Brooklyn. I like to spend the first day of the year taking a long walk in either Prospect Park or Green-Wood Cemetery and trying to find as many birds as possible. While this January 1st didn't reveal anything out of the ordinary, in the first 11 days of the year I've already seen some interesting birds. On New Years Day Robin and I walked to the cemetery where we ran into my friend Ed. We spent the next 90 minutes birding together. The roadways in Green-Wood were all plowed, but the paths and hillsides were still blanketed in deep snow. Still, the weather was sunny and clear and just wandering the roads through the fields and valleys was a head-clearing way to begin 2011. Most of the songbirds seemed to be hunkered down elsewhere as we saw few birds compared to the previous week. We caught distant views of a trio of Red-tailed Hawk and, on our way out, spotted a very vocal kestrel diving at a perched Cooper's Hawk. The kestrel is nearly one quarter the size of the coops, so I was surprised that he actually succeeded in driving it off. A day later temperatures climbed into the 40s causing some of the snow to melt and creating an eerie, fog landscape throughout Prospect Park's fields and meadows. Most of the birds I encountered on this day were either huddled around two small openings in the ice on Prospect Lake or gorging themselves at the bird feeders near Breeze Hill. Of the 35 species that I recorded that day, 24 of them were at or near the feeders. One nice surprise was spotting a small number of Pine Siskins feeding at the well-stocked thistle feeders. 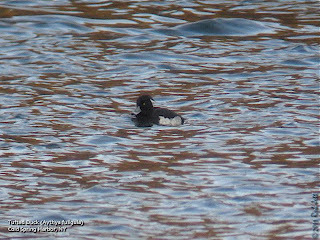 Shane called me that Tuesday to tell me that a Tufted Duck had been spotted on the north-shore of Long Island in the town of Cold Spring Harbor. He and Doug were planning on driving out to look for it the next day before sunrise. Would I like to join them? This rare vagrant is normally found in temperate and northern Eurasia. It occasionally strays to both coasts of North America and I've unsuccessfully chased down reports of one several times in the past. Of course I'd be joining them, but had to be back early. The duck had been spotted within a flock of scaup on a small, protected bay in the Suffolk county town of Cold Spring Harbor. It is about an hour drive from Brooklyn. I would be getting picked up at around 6:15am, so, with any luck, we'd quickly find the bird and be back in the city before 10am. We pulled into a small parking lot adjacent to a public dock at the same time as two other birders. There was another person already on the dock, scanning flocks of scaup. I was still setting up my tripod when I noticed something curious; everyone was facing south and looking through a large number of waterfowl towards the inner harbor ... except for Doug. He had walked to the opposite end of the dock and was scanning a small flock to the north. I thought to myself, "Doug is going to find the Tufted Duck". Seconds later Doug shouts, "I've got the bird!" The rising sun hadn't cleared the tops of the trees yet, so it was fairly difficult to pick out the bird. We decided to drive a short distance up the road to a better vantage point. From a small, rocky beach across the street from the state park parking lot we had great views of this rare bird. The bird was actively feeding within a small flock of scaup, diving every few seconds. Each time his head broke the surface of the water, the distinctive, swept-back shock of head plumes stood out, announcing his virtual royalty among the common ducks. We watched the bird for about 30 minutes. Several other birders arrived carrying scopes and looking somewhat "camouflaged" dressed in their office garb. On the drive home I began thinking about waterfowl in the winter. I decided that this year I would try and take full advantage of the seasonal bird fluctuation. For example, the greatest abundance and diversity of waterfowl around Brooklyn occurs in the winter. I would spend my birding time in January trying to observe all of the possible species of duck. With nearly all the lakes and ponds frozen, that would mean covering all the coastal habitats. The next time I went out I did the Coney Island Creek/Coney Island Boardwalk loop. This walking route starts at the creek south of Dreier-Offerman Park, follows west along the creek to Coney Island Creek Park, cuts across the edge of Seagate to the western edge of Coney Island, continues along the beach to the fishing pier, then back to the Stillwell Avenue subway station. At Coney Island Creek I quickly relocated the Redhead that Heydi and I first spotted on December 30th. 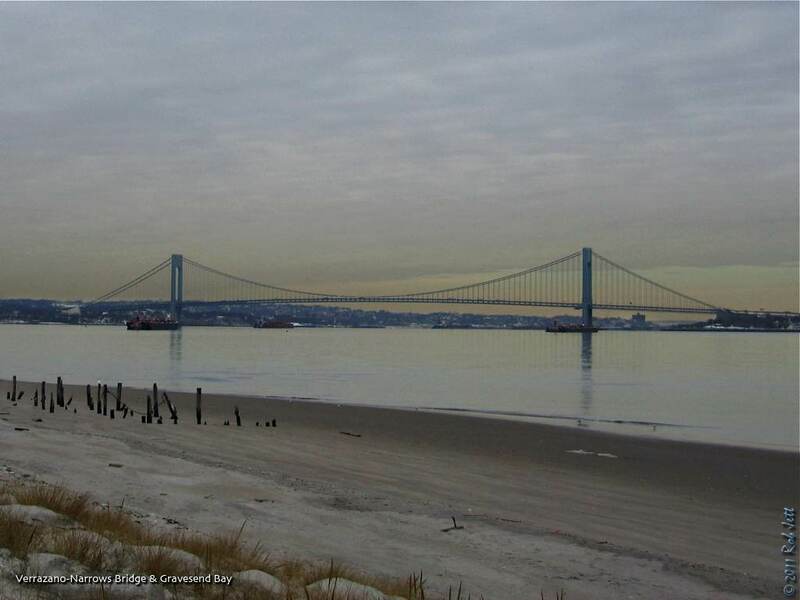 From the beach at Coney Island Creek Park I scanned a very calm Gravesend Bay. There was a nice diversity of water birds - Brant, Canada Goose, Greater Scaup, Bufflehead, Common Goldeneye, Red-breasted Merganser and my first Red-throated Loon of the season. 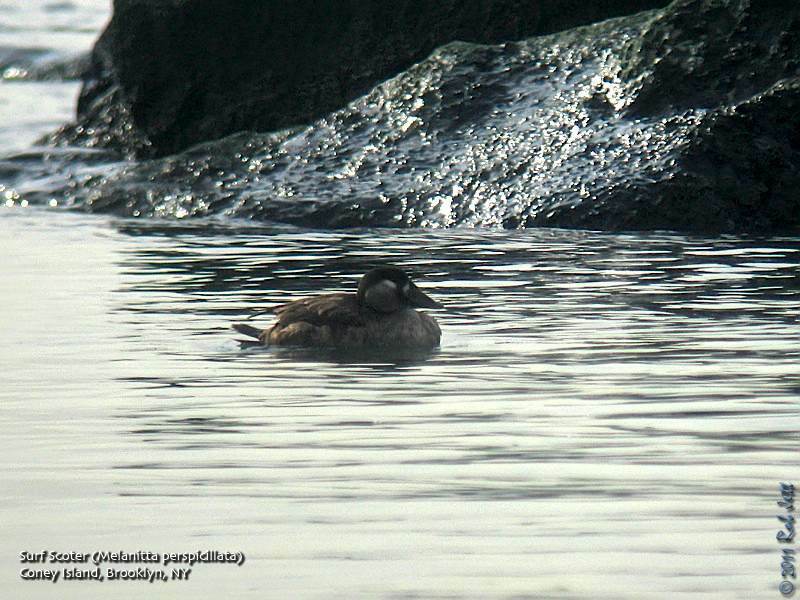 At the western end of Coney Island I spotted a Surf Scoter hanging around the rock jetty at that location. Along the beach I checked all the gull flocks, hoping for something unusual, but found mostly just Ring-billed Gulls. Searching the water from the fishing pier turned up about a half-dozen Common Loons. By the time I headed back to the subway station I had tallied 18 species of water birds; Brant, Canada Goose, Mute Swan, Gadwall, American Black Duck, Mallard, Redhead, Greater Scaup, Surf Scoter, Long-tailed Duck, Bufflehead, Common Goldeneye, Hooded Merganser, Red-breasted Merganser, Red-throated Loon, Common Loon, Double-crested Cormorant and American Coot. The Redhead was the only relatively rare bird that isn't seen in Brooklyn every year. Continuing with the waterfowl theme, Heydi and I decided to do a marathon duck day this past Sunday. Our plan was to begin the day at Hendrix Creek, then go to Coney Island Creek to find the Redhead for her and continue the aforementioned Coney Island loop. Hendrix Creek is a great spot for overwintering ducks. There is a water treatment plant on the creek which, I assume, keeps the water warmer than the surrounding area. 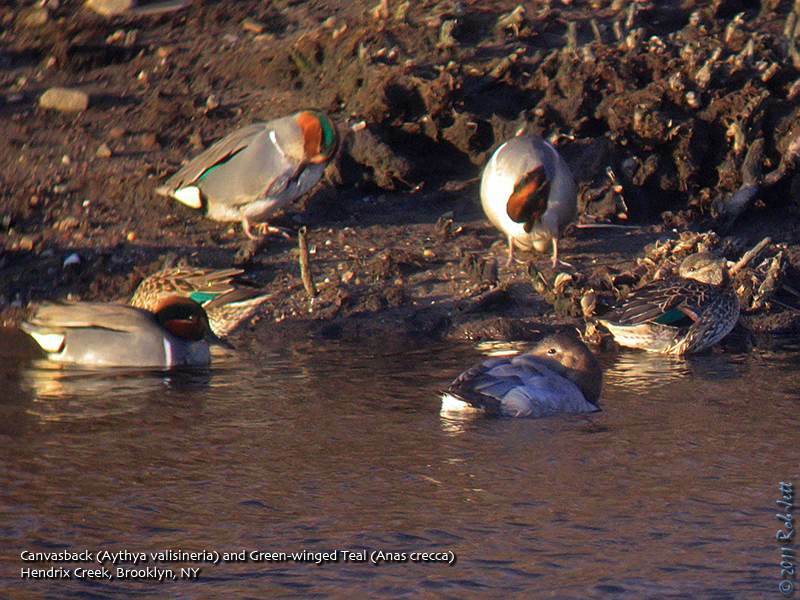 Large numbers of Green-winged Teal can be found here, as well as, the occasional Canvasback. We were mostly hoping to find a Canvasback, as they are rare around Brooklyn. We were very lucky and found a sleeping Canvasback within the first flock of teals that we focused on. Later on we spotted a flock of about 23 more near the mouth of the creek. After only about 45 minutes we had a pretty impressive list of birds, included a couple of unexpected species - Great Blue Heron and Belted Kingfisher. We left Hendrix Creek with 13 species of waterfowl under our belts; Brant, Canada Goose, Gadwall, American Black Duck, Mallard, Northern Shoveler, Green-winged Teal, Canvasback, Greater Scaup, Lesser Scaup, Bufflehead, Hooded Merganser and Ruddy Duck. We weren't as fortunate at Coney Island Creek. Twenty to thirty mile-per-hour Northwest winds were churning up the water and the only waterfowl visible were a few small flocks of Canada Goose hugging the northern shoreline. The Redhead would have to wait for another weekend. It was at that point I remembered something Shane told me: The Black-headed Gull appears on the Veterans Memorial Pier in strong northwest winds. We jumped back in the car and headed across Cropsey Avenue towards Owls Head Park and the pier. This gull has become Heydi's jinx bird. She has gone looking for it five times since last January. What made it even more frustrating was that other people had seen it either right before her or right after her. I assured her that we would find it on Sunday. An arctic blast was roaring across the pier when we arrived. Ahead of us there were three distinct flocks of Ring-billed Gulls facing into the wind and clinging to the ground. They were huddled near the base of paired metal picnic benches that were, thankfully, bolted to the pier. The legs of the benches created a small windbreak for the gulls and several pigeons. We scanned the first flock. No black-headed. We walked slowly to the next and scanned. Still nothing. Then we headed towards the end of the pier and the last flock of gulls. At the left edge of that flock and separated from them by a couple of feet I spotted the bright red bill and legs of an adult Black-headed Gull. All the gulls flushed, at one point, but the black-head flew back and join a flock closer to the beginning of the pier. Heydi took this really nice photo of it from only a few yards away. Later in the morning we headed over to Floyd Bennett Field and Dead Horse Bay. When we were stopped at the intersection of Avenue V and Flatbush Avenue, facing Mill Basin, I noticed two very large, dark birds soaring over the water. Heydi made the turn onto Flatbush as I focused on the birds through the car window. I said that one looked like a Black Vulture. She said, "ARE YOU KIDDING ME?!" and tried not to drive off the side of the road (she's been convinced that she would never see a Black Vulture in Brooklyn). I told her to turn into the parking lot at "Nick's Lobster". We bolted out of the car with bins in hand and got great looks at two Black Vultures as they battled the wind, soaring over the Marine Park Golf Course. 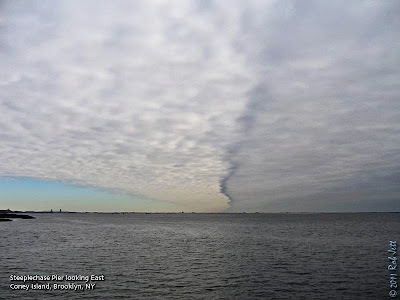 At home I referred to Google Earth and the birds were heading West-North-West, in the general direction of the Verrazano Bridge. There is a pair that nested at Fort Wadsworth on Staten Island last year. Maybe it was that pair and they were out for a quiet Sunday stroll...in gale force winds.